Earn $12.39 in VIP credit (1239 points)What's This? The White Industries Dos ENO is the perfect way to add some versatility to your single speed bike. This smart design places two speeds on one freewheel, allowing riders to manually move the chain between gears when lower or higher gears are desired. Unlike traditional disposable freewheels, the Dos ENO uses a top quality sealed cartridge bearing that keeps out mud, dust and grime and is easily replaced when worn. A precision machined inner driver and outer gear case eliminate tight and loose spots associated with lower quality freewheels. Finally, a 36 tooth engagement system and a case hardened, electroless nickel plated outer gear case provide instant power transfer to the pedals, outstanding protection from the elements, and jaw dropping looks. 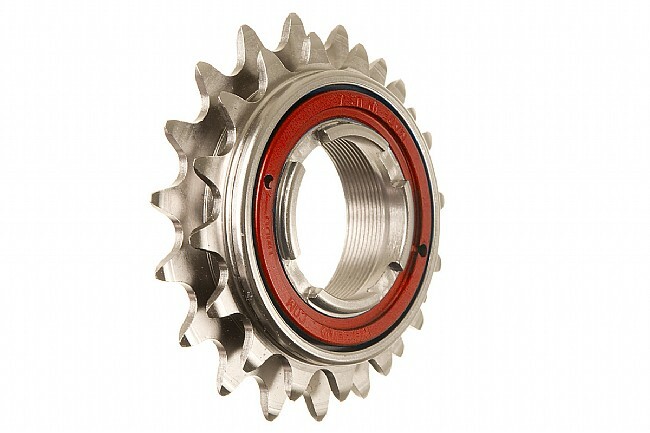 The White Industries Dos ENO Freewheel is available in 16/18T (Blue), 17/19T (Red) and 20/22T (Red) sizes. Silver. Made in the USA.